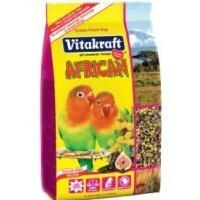 Vitakraft African Parrot Food - Small Breed 750g is a delicious and highly nutritional meal for your African parrot. Made from a special blend of seeds and fruits that would be found in the parrot's natural habitat, this healthy vitamin packed feed is perfect for smaller parrot breeds such as the Lovebird. Cereals, Seeds, Fruits (dates, carob, figs and whitehorn), Minerals and Acacia flowers.